13 Happy Homicides is live! 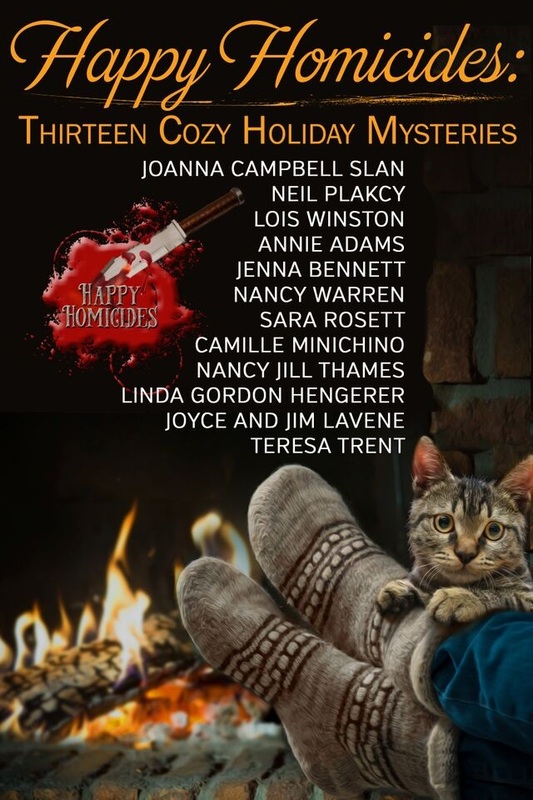 A collection of thirteen traditional mysteries to celebrate the holidays, written by thirteen bestselling and award-winning authors. Heartwarming, brain-puzzling, and character-driven reads that’ll keep you entertained for hours. At 213,000 words, it offers nearly 800 pages of reading material, plus a special FREE Recipe and Craft Bonus File as our gift to you. Details inside. Authors include Joanna Campbell Slan, Neil Plakcy, Lois Winston, Annie Adams, Jenna Bennett (that’s me), Nancy Warren, Sara Rosett, Camille Minichino, Nancy Jill Thames, Linda Gordon Hengerer, Joyce and Jim Lavene, and Teresa Trent. And best of all? It’s only 99c! It’s not loaded on iBooks, sadly, but if you’re an iBooks reader, on an iPad or iPhone, you should be able to download the file from BN or KOBO, and have it work for you. They all – except Amazon – use the same ebook format. Next → Next post: Stalking Steven is here!